Riotous applause—a high scream from a soprano—a crude trombone bass note—silence—more riotous applause: We’re off on another Stockhausen adventure. Momente originally appeared in 1962, a time when the composer seemed to be redefining the avant-garde with each successive work. In this one, he sets out his vision for “moment” form, an approach to musical structure that is at once mobile and tightly defined. The score is made up of short sections, “moments,” which are grouped into three kinds: M, melodic; K, Klang, i.e., sounds; and D, durations. These are arranged by the performers into a work of approximately one hour duration (in this version). A recipe for formlessness meandering it would seem, but Stockhausen ensures that it all adds up by imposing a set of sophisticated rules, allowing the performers to choose from within the M, K, and D groups. He further ensures continuity with the addition of inserts, foreshadowings or recollections of individual moments heard simultaneously with the preceding and succeeding sections. The work is for soprano soloist, four choirs, and 13 instrumentalists. Additionally, the choristers all play percussion instruments, creating an overall texture that balances, fairly evenly, the sound of unpitched percussion, choral interjections (not just singing), brass instruments, and some live electronics. The soprano soloist gives a useful point of focus to all this, both in terms of timbre and text, the “libretto,” such as it is, drawing on anthropological treatises, the Bible, and William Blake. It all makes for a diverse and endlessly fascinating listening experience, more diffuse, perhaps, than most of Stockhausen’s earlier works, but as vibrant and innovative as anything he produced. Stockhausen himself conducts this performance, making it one of the very few composer-led recordings of any of his works (although he was arguably more influential at the mixing desk, his preferred position in later performances and recordings). The performance is excellent, with all the singers and instrumentalists clearly committed to the project and capable of the wide and esoteric range of musical activities required of them. The most surprising aspect of this recording is the sound quality. If you didn’t know it was from 1965, you could easily mistake it for brand new. Careful listening reveals a slight dullness to the tone in places—the nearest thing to a giveaway—but it detracts little from the immediacy of the experience. The recording was made by WDR and originally released on vinyl by Wergo in 1967. The LP probably sounded just as good as this, but Wergo tells us that the recording was remastered to DSD in 2012. The accompanying documentation is also excellent, reproducing program notes from two performances and a broadcast, which, between them and some useful diagrams, give the general listener a broad overview of the ideas behind the form, as well as of the myriad sound sources and the unusual stage arrangement. The mobile form makes direct comparisons with other recordings problematic, but a more significant issue is the revision history. This recording presents the 1965 version, a halfway house between the 1962 original and the 1969 final version. The revisions involved reworkings of the D moments and the addition of new moments, increasing the sophistication, and the length, each time. 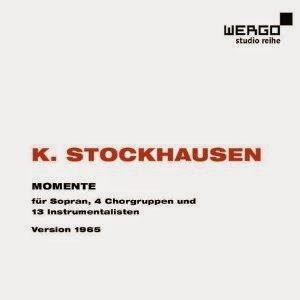 This CD represents the earliest available version, but later recordings, from 1972 and 1998 (both realizations of the 1969 final version) are published by the Stockhausen Foundation for Music and are available via their web site karlheinzstockhausen.org. This review appears in Fanfare Magazine, issue 38:2.